Above: These are not good pictures, and I apologize because the difference is rather interesting to see, but we have heavy cloud cover today. Click to enlarge. On the left are the colors I used (listed below). On the right are the same colors topped with the Effects that I have. The 3 white shades on the wheel that have no number are the Effects. The one at the top is Crimson Sparkle, the one on the right side is Ice Blue Shimmer and the one on the left side is Copper Shimmer. The 'nails' that follow each one without a number are topped it that Effect. All number 1's are the same color, just different Effects, all number 2's are the same, and so on. My favorite has got to be the transformation of number 6 on the left. Above: A quick manicure using CND Raisin in the Sun (a very deep chocolate brown creme) topped with CND's Effects in Ice Blue Shimmer. Quite a change from the dark chocolate shade. Above & Below: These are the colors I used and they correspond to the numbers on the color wheel. 1-CND Raisin in the Sun, 2-CND Relay Red, 3-CND Marshmallow Rose, 4-Finger Paints Plum Crazy, 5-Misa Push Upon It, China Glaze Gussied Up Green. Below are the 3 Effects I used, L-R: Crimson Sparkle (top of wheel), Ice Blue Shimmer (right side of wheel), Copper Shimmer (left side of wheel). 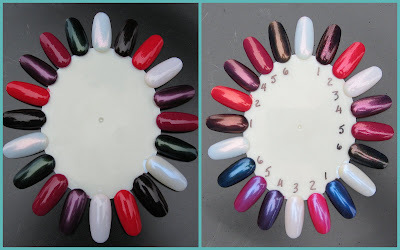 Yesterday I talked about CND's new Colour Effects line that recently came out, and today I did a little swatching to see how the Effects performed over various base colors. I had a little too much fun doing this, but that's always a plus when a polish gives us a some entertainment value too! 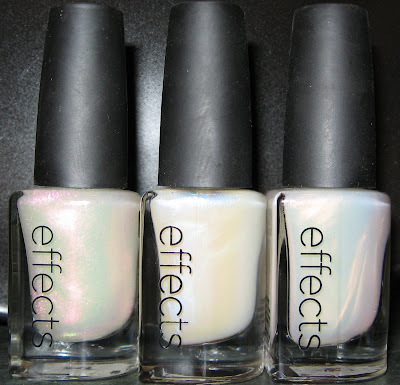 There are 3 types of Effects according to CND's website: "Pearls—the finest opalescence. Shimmers—more dramatic. And Sparkle Effects—the blingest!" I only have one Sparkle and two Shimmers, but am very tempted to get a Pearl after this layering experiment I did this morning. The Sparkle doesn't change the base color as dramatically as the Shimmers do, except over the darkest shade I used, which was a very dark chocolate brown creme (CND's Raisin in the Sun). It does however, add a very fine coating of glitter or sparkle to any base, and obviously, different base colors give you different glitter or sparkle colors. The Shimmers not only add a fine shimmer effect, but completely transform the base color, especially on the darker shades. I found myself anticipating and guessing what each base color would turn into once I layered the Effects over it, and I don't think I was disappointed in any of them. This seems like lots of fun to play with. Maybe you can just buy the special effects to play with what you have. That is an amazing change from dark chocolate. I had to go back three times to make sure what I was looking at. it's like magic;) great effects! OMG, this is amazing. Especially the Raisin in the Sun Manicure that you did. I was NOT expecting that blue. I'm a little more impressed than I was expecting to be. I didn't want to aim so high that I was disappointed and these don't disappoint! Lucy~you could definitely just use the Effects, although the polishes have a great new formula. I notice much more change using the Effects over darker shades. Nosaby~I thought so too! Not so much with the Sparkles, but with the Shimmers it's really a change. AdorePink~I used the Shimmer Effect first, which was nice, but nothing earthshattering. But the Shimmers...wow! AllYouDesire~it was very fun and I can't wait to try them some more. Kae~I really want to try a Pearl now and see if the change is as dramatic as with a Shimmer. I'm glad CND has released these. how cool are these!!? ?